Petaling Jaya, 28 Oct. 2010 – Universiti Kebangsaan Malaysia (UKM) is co-operating with the Malaysian Productivity Centre (MPC) to raise its quality and productivity through five main frameworks covering teaching and learning; usage of facilities; allied programmes; research and development cases and certification programmes that had been agreed to. A Memorandum of Understanding was signed here today between UKM and MPC to carry out the scheme. It was signed by the Deputy Vice Chancellor (Industry and Community Partnership) UKM, Prof. Dr. Saran Kaur Gill and MPC Deputy Director General II, Encik Abdul Latiff Abu Seman withness by MPC Director General, Encik Mohd Razali Hussain. 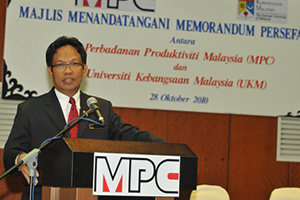 Prof Saran Kaur said UKM welcomed MPC and the industries to be involved with its activities in the campus and praised efforts of the Faculty of Science and Technology to get its lecturers participate in Cross-Fertilization Programme with MPC officers which also agreed to provide industrial and practical training for UKM students for one semester. Encik Razali described the realtionship between MPC and UKM as special following their cooperation since 1996 when MPC and the Faculty of Technology and Information had carried out joint surveys on automation and robotics. Through this latest co-operation, MPC hoped to help the government in implementing The New Economic Model and Economic Transformation Programme especially in the field of innovations. They will also cooperate in undertaking case studies and research activities based on matters involving productivity, quality, competitiveness and innovation in industry which will involve masters and PhD students based on research cases given by MPC. Students and UKM lecturers will also be involved in Certification Programme using COMPASS softwares. They will be given training for two days to understand COMPASS softwares and using it in companies that have been identified. Those completing their productivity report using COMPASS softwares will be given COMPASS Usage Software Certificate.